The Intelligent Key functions can only be used when the Intelligent Key is within the specified operating range. When the Intelligent Key battery is almost discharged or strong radio waves are present near the operating location, the Intelligent Key system’s operating range becomes narrower and may not function properly. If the Intelligent Key is within the operating range, it is possible for anyone, even someone who does not carry the Intelligent Key, to push the ignition switch to start the engine. 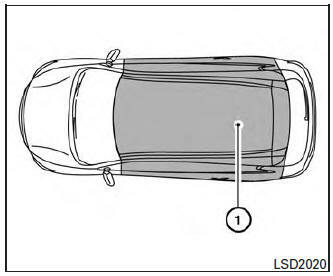 The operating range of the engine start function is inside of the vehicle 1 . The luggage area is not included in the operating range, but the Intelligent Key may function. If the Intelligent Key is placed on the instrument panel, inside the glove box, storage bin or door pocket, the Intelligent Key may not function. If the Intelligent Key is placed near the door or window outside the vehicle, the Intelligent Key may function.